Our miracle cat, Mikan, has been so healthy and brightening our daily lives together by showing her ever-evolving cat-personality! She is almost seven months old, and she is not yet in heat. She had such a physically weak start of her life, so it might take a little bit more to mature physically. Well, her mom thinks it is just fine, and is even happy about seeing Mikan still a little kitten. Our vet suggested (and I totally agree) to wait to spay her until she hits a few heat cycles. In that way, her skeletal system will be able to grow properly with support from adequate natural hormone levels. Anyhow, Mikan will have a vet visit coming up this week (due to her coughing), and another soon for sure when she is ready for a spay surgery. Now, I’m thinking how to make her feel comfortable with a car ride to the vet (or at least OK with it). Only thing I could think of is…yes, you guessed it, positive reinforcement and training! I wish I don’t need to do all that, but it seems necessary for the benefit to this family as a whole. Happy cats = happy family. 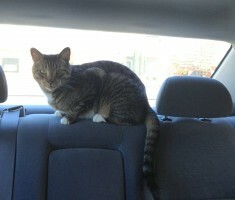 It was a very sunny Sunday afternoon when we decided to take both cats on a pleasure ride. Mikan always follows Tora around everywhere in the house, so it could be good thing. 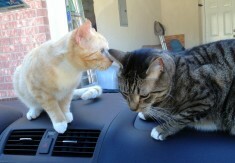 Jeffrey and I loaded up Tora and Mimi in my car. Tora likes being “free” in the car, but we kept Mikan in her carrier where she feels safe with her blankie, with the flap left open so that she could come out if she wants to. We drove around our neighborhood for about 15 minutes. At first, Mikan looked nervous in her carrier. She was watching the scenery passing fast in front of her eyes. Her eyes were wide open. Thankfully, her breathing was normal. On the other hand, Tora was totally chilled and perched on the back shelf near the rear window, and enjoying the view and the movement of the car. After the ride: "There are lots of space here." After about five minutes of driving at 15 mph. in our neighborhood, Mikan came out of her carrier and walked toward the window. I gave her a little treat – she ate it. Yes, she is a sucker for these crunchy treats. We did that routine a few more times, and it’s time to go home! It’s good to stop when it is still positive experience. 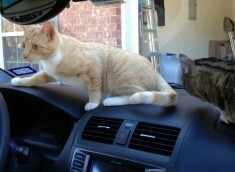 I believe that Tora being there with Mikan helped her feeling secure about being in the car. Tora’s energy was relaxed in the car, and our human energy was good also because we knew it was a fun ride for them. "Hey Brother, the car ride wasn't that bad, but don't tell mom and dad because I prefer playing with you in the yard." Who do I thank the most for the first training? I thank Jeffrey for his safe driving (he hates driving slow, but he was willing 15 m.p.h. for his little girl, Mikan), and mostly, I thank Tora for being a such a confident car-rider! He is my little big boy. We continue to dream about days in the future that we could travel with our furry kids for a weeks-long or even a month-long vacation. So far, so good. More rides to come.